All of us already know what hearing is but you should know what is hearing loss as it has become a common complication nowadays. Hearing impairment or hearing loss is a problem which occurs when there is a problem with one or more ear parts. A person with hearing loss may have a partial or complete hearing loss while impairment means that something is not properly functioning. Deaf or deafness is the most common word regarding profound hearing loss. Nowadays, hearing impairment ratio is the most alarming birth defect which is about 3 in 1000 babies. There are three parts of an ear: outer, middle and inner ear.Pina or the outer ear receives sound waves and these waves then travel to the outer ear canal. When sound waves strike the eardrum in the middle ear, it vibrates and starts vibrating three bones of an ear called hammer, anvil and stirrup, which then help sound waves to the inner ear. These vibrations travel to a cochlea, filled with liquid and have numerous hairs on its surface. This problem occurs when there is an ailment in the outer or middle ear. Patients suffering from this complication have a mild hearing loss, but mostly it is temporary and can recover with a general medical treatment. A patient having such a complaint is due to a problem with connection from a cochlea to the brain. Neural means which is related to nerve so persons suffering from neural hearing loss means that the nerve which carries messages from a cochlea to patient’s brain is damage. This occurs when a cochlea does not work properly because of the destruction of tiny hair cells; patient can’t hear any sound in noise but can listen only in silence. Patient can listen to some sounds or may be no sounds at all. 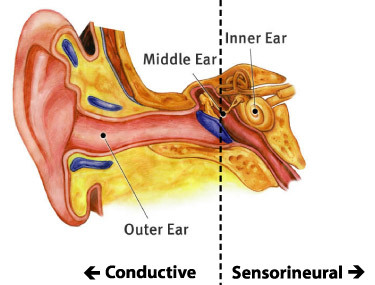 Sensory hearing impairment is almost permanent.